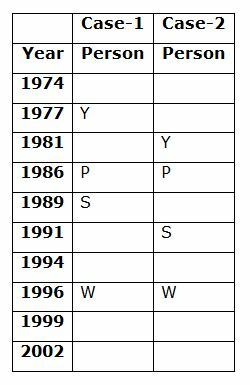 Ten persons are born in different years viz., 1974, 1977, 1981, 1986, 1989, 1991, 1994, 1996, 1999 and 2002. Not more than one person born in the same year. Their ages were calculated with respect to the year 2018 and all of them are born in the same date and month. Three persons are born between P and W but the age of both of them are not in odd number. P is elder than W. Two persons are born between S and Y, who does not born after P. Q was born immediately after V.As many persons born between S and Q is same as the persons born between W and R. Only one person was born between U and T, who is elder than both X and U. 1. Who among the following persons is youngest? Three persons are born between P and W but the age of both of them are not in odd number. 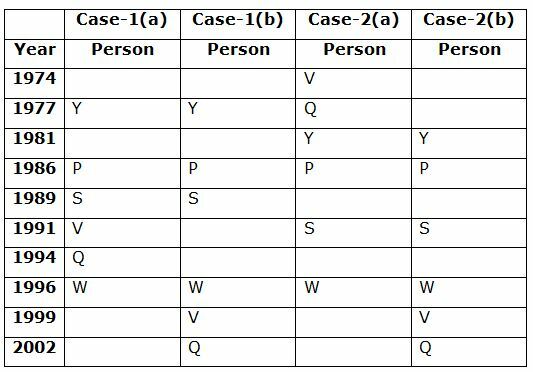 P is elder than W. Two persons are born between S and Y, who does not born after P.
Q was born immediately after V.
As many persons born between S and Q is same as the persons born between W and R.
Only one person was born between U and T, who is elder than both X and U. 4. 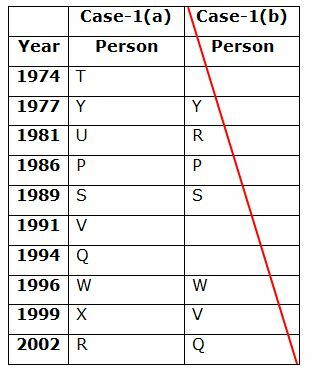 How many persons are born between Y and Q? 5. What is the sum of the ages of P and Q (in years)? Direction (6-7): Read the following information carefully and answer the questions given below. Five friends P, Q, R, S and T bought different shirts of a different price. P paid more than both T and R. Only Q paid more than S. R did not paid the minimum amount. R paid Rs.2000 for the shirt. 6. Who among the following paid the second lowest amount? 7. If S paid Rs.3000 for the shirt, then what is the possible amount that P paid? 8. How many such pairs of letters are there in the word ‘COMPOSE’, each of which has as many letters between them in the word as they have between them in the English alphabetical series? 9. If in each vowel of the word CITIZEN is changed to the next letter in the English alphabetical series and each consonant is changed to the previous letter in the English alphabetical series and then the alphabets are arranged in alphabetical order from left to right. Then which of the following will be fourth from the left? 10. The position of how many digits in the number 421368 will remain unchanged if the digits within the number are written in ascending order from left to right? Three persons are born between P and W but the age of both of them are not in odd number. 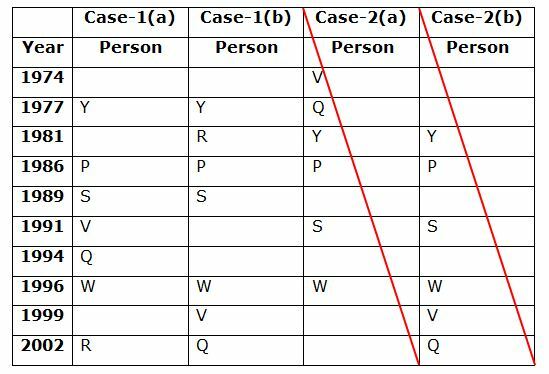 P is elder than W. Two persons are born between S and Y, who does not born after P. Q was born immediately after V. As many persons born between S and Q is same as the persons born between W and R. Only one person was born between U and T, who is elder than both X and U. 1) Who among the following persons is youngest? 4) How many persons are born between Y and Q? 5) What is the sum of the ages of P and Q (in years)? 6) Who among the following paid the second lowest amount? 7) If S paid Rs.3000 for the shirt, then what is the possible amount that P paid? 8) How many such pairs of letters are there in the word ‘COMPOSE’, each of which has as many letters between them in the word as they have between them in the English alphabetical series? 9) If in each vowel of the word CITIZEN is changed to the next letter in the English alphabetical series and each consonant is changed to the previous letter in the English alphabetical series and then the alphabets are arranged in alphabetical order from left to right. Then which of the following will be fourth from the left? 10) The position of how many digits in the number 421368 will remain unchanged if the digits within the number are written in ascending order from left to right?